New 2 bed apartment with pool and tennis - Property for sale. 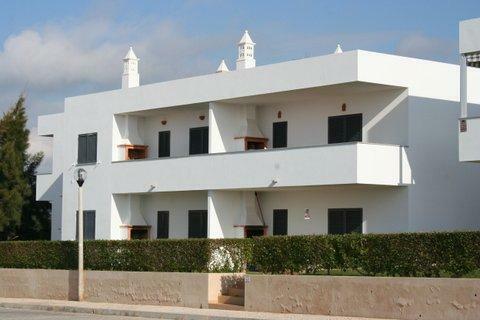 Full Description: These new apartments are in a rural location close to the village of Pera, midway between the resorts of Albufeira and Armacao da Pera, approximately 30 minutes from Faro airport. Pera with its local shops and restaurants is within walking distance or a short drive. The famous Praia Grande beach, Salgados Lagoon and golf course are within easy reach via a longer walk or short drive. The remaining apartments are ground floor and all have access to the pool and garden areas from their private terraces with built in BBQ. The 1 bedroom apartments have a kitchen dining area and lounge, the 2 bed apartment has a separate kitchen with a lounge dining area. Double bedrooms have fitted wardrobes and the bathrooms are fully tiled with a shower fitting over the bath. The condominium has a large communal swimming pool with separate childrens pool, extensive garden area and tennis court. These are very nice apartments in a good location offering value for money in the current marketplace. Finance is available.